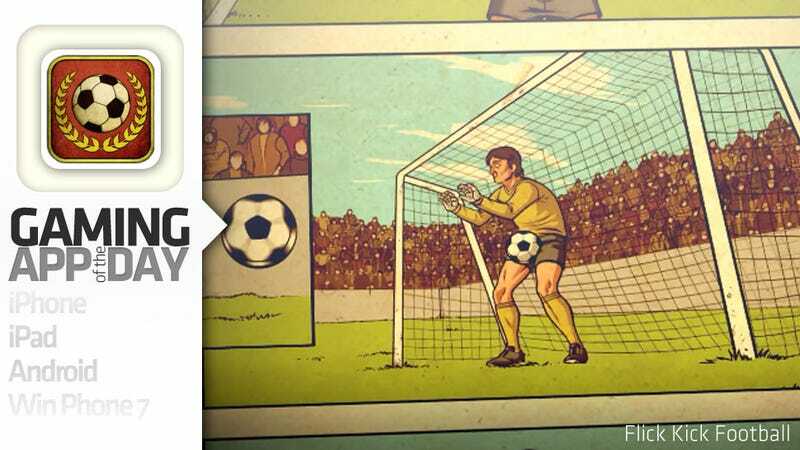 Flick Kick Football is about kicking balls. And that's it. Simple premise, but also a highly effective one. It's the latest in a long line of "flick" games from Kiwi studio PikPok, who have released similar titles focusing on kicking a rugby ball and kicking an American football. This one, though, is the best, not just because the addition of defenders and a goalkeeper makes it more interesting (other ones just have you battling the wind) but because there's a charm to your moustachioed opponents and their retro stylings that make it not just fun, but occasionally funny. It's not the meatiest game on the iPhone, but for only $1, it's one of the best time-wasters you can get.